Book review: "The City & The City"
This review first appeared in Turbula in June 2009. It was also published in the North County Times on June 7, 2009. China Miéville's latest is drawing comparisons to the dark political fantasies of Orwell and Kafka  but a more accurate comparison might be to his contemporary, Michael Chabon. In particular, Chabon's 2007 alternate-history murder mystery "The Yiddish Policeman's Union." While the British Miéville's "The City & The City" is utterly European, sharing a heritage both cultural and stylistic with Orwell and Kafka, ultimately it's a story about finding your place in a seemingly foreign environment. And it's told within the confines of a murder mystery. These two facets give "The City & The City" much more in common with Chabon's very American tale than with Orwell or Kafka. Where "The Yiddish Policeman's Union" takes place in a fictional Jewish homeland on Sitka Island in Alaska, "The City & The City" is set in the fictional twin cities of Beszel and Ul Qoma. But unlike familiar twin cities such as Minneapolis-St. Paul or Tampa-St. Petersburg, the Central European city-states of Beszel and Ul Qoma don't sit side by side, but upon the same slab of land. The strange rules governing these two cities are revealed slowly by Miéville, as his protagonist and narrator, Inspector Tyador Borlú, investigates the discovery of the remains of a young woman found murdered in Beszel. As evidence points to her being killed in Ul Qoma and dumped in Beszel, Miéville begins to describe the lives of the citizens of these two conjoined but hostile city states. It is here that the comparisons to Orwell and Kafka are most apt: The residents of Borlú's native Beszel are taught from birth to see only the parts of their surroundings that are Beszel  to "unsee" residents and buildings of Ul Qoma. Distinct in architecture, fashion and language, the citizens live in a shared city where to notice the other is to invoke the much feared "Breach"  a transnational security apparatus that makes sure those who don't live by the rules are never heard from again. 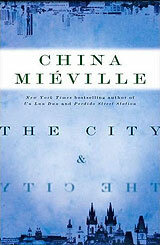 Miéville's fleshing out of this bizarre "city and a city"  where to visit your next-door neighbor from the other city requires a passport, visa and trip to the border station in the center of town  is wonderful. Beszel and Ul Qoma seem positively real from the first paragraph. And as with "Yiddish," Miéville's descriptions of his imagined world are woven seamlessly into the advancement of the mystery. When Borlú is sent to Ul Qoma to assist investigators on that side of the "border" with the investigation, he discovers that even the members of the Breach aren't as all-knowing as he'd believed, and there are threats to the very existence of Beszel and Ul Qoma as separate places. While Orwell and Kafka struggled to explain how human beings might resist totalitarianism, and J.G. Ballard, an obvious Miéville influence, used his novels to argue in favor of resisting an increasingly technological future, Miéville plumbs more current themes  how to live true to oneself while resisting all those unseen forces of modern life that try to reshape us. Like Chabon and the late Italo Calvino (who addressed similar issues with similarly surreal settings), Miéville's outlook is optimistic, despite the tremendous difficulties and challenges. Miéville has created a convincing alternate world, one with its own mythology and history, peopled with real-to-life characters. It's a superb read, one of those all-too-rare books that pulls you completely into its pages.